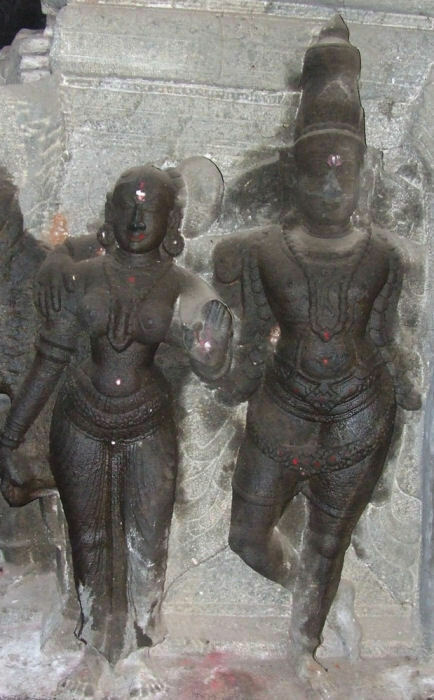 Gokarneswara or the popularly known Brihadambal temple is at Thirugokarnam. Thirugokarnam lies on-route to Pudukkottai in the Thiruchirappalli-Pudukkottai highways and about 5kms from Pudukkottai town.The temple is a big complex originated as a rock-cut cave developed into a multifaceted complex with various mandapas, shrines, sub-shrines etc. The major shrines in this complex are Gokarneswara, Mahilavaneshwara, Brahadambal, Kasiviswanatha. 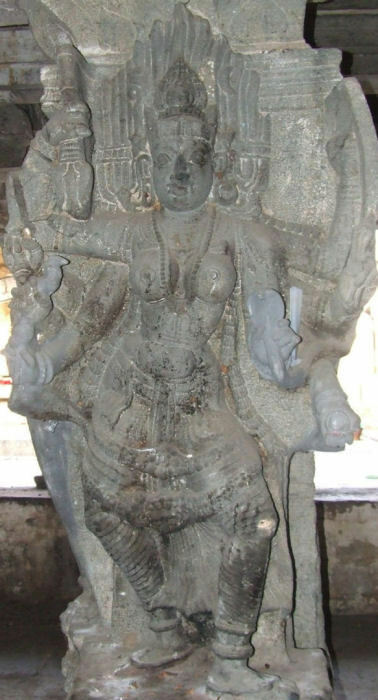 Though the presiding deity of the temple is Gokarneswara the goddess Brihadambal or Araikkasamman is popular in the locality. The rock cut shrine is on the western side of the temple complex facing east. The hillock in which the rock cut shrine is scooped is short outcrop and spread to a small region. In passage of time the rock cut shrine grow in, around and above the hillock as a big complex. 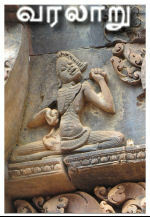 The temple complex starts with a gopura entrance in the south. The gopura leads to the colonnade which has huge pillars and platforms on either side. The walls in the frontage and the ceilings of the entire colonnade are adorned with paintings that belong to Nayak period. The temple office and vahana mandapa lies on the west. In the end of the colonnade is seen the Kasiviswanatha shrine and a mandapa on the west. The second gopura entrance is flanked by dvarapalas and leads to the next passage in which a decorative mandapa lies on the west. 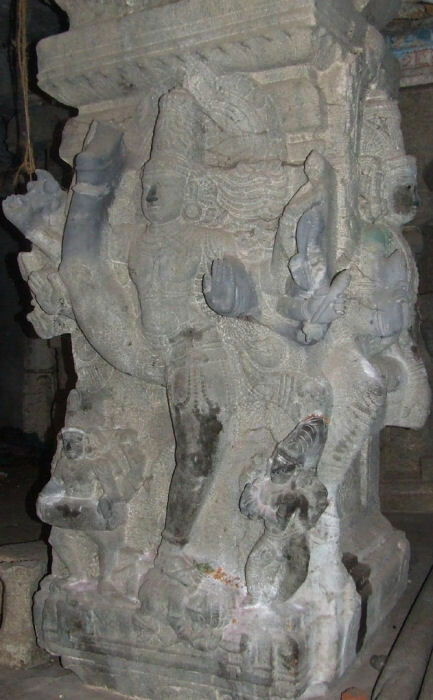 Massive pillars with sculptures like Siva in Urthavathandava with Nandi as a percussionist, Brahma handling cymbal. 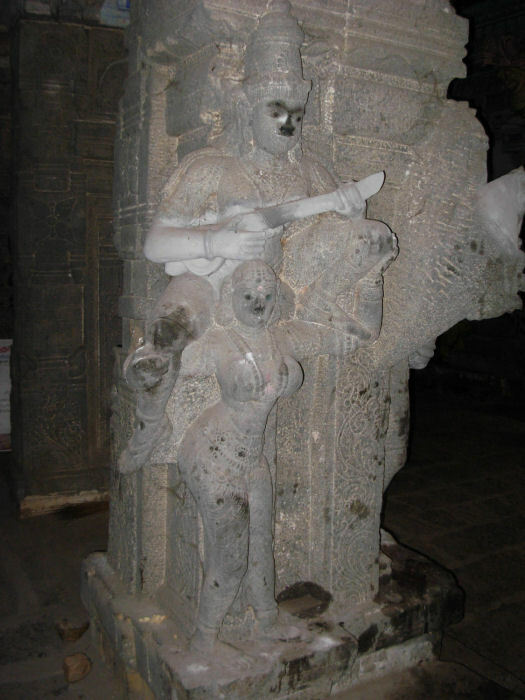 Opposite to Siva’s Urthavathandava is seen dancing Kali, another pillar carry a male handling instrument sitting on the shoulder of a female, one of the pillar possess Manmathan-Rathi duo, some pillars also carry devotees which all are noted to speak. The third entrance is also a gopura passage which leads to a mandapa in which on the western side is a shrine for goddess Brahadambal facing east and followed by Mahilavaneswara shrine. On the eastern side of the mandapa is the shrine for goddess Mangalanayaki the consort of Mahilavaneswara. On the southern side adjoining the mandapa wall the sixty three Nayanmars are displayed on a platform. The temple tank and the stalavriksha are seen on the eastern side of the mandapa. A passage to the west of the Mahilavaneswara shrine leads to the mandapa in front of the rock cut shrine. The mandapas in front of the rock cut shrine are of later origin. The first mandapa which has a passage both on the south and on the east is pillared hall with Nandi, a small mast and hundi made of metal are placed facing the sanctum. The passage in the east leads to the second mandapa where dvarapalas flank the entrance. The second mandapa leads to the third mandapa where a Nandi is seated facing the rock cut shrine inside a small pillared pedestal. 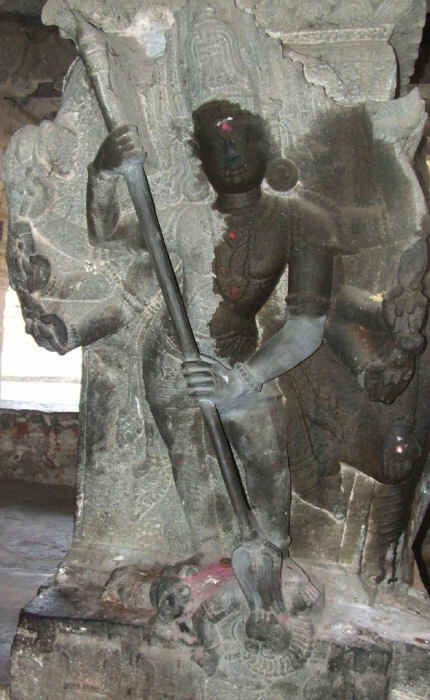 Next to the Nandi is the huge dvajastamba with metal casing. The second and the third mandapa gradually elevate up and the third mandapa has the partial filling of the mother rock on its north. Stairs on the eastern side of the mandapa leads to the shrines in the second floor. Shrines for Muruga, Sarasvathi, Mahalakshmi, Durga, Annapurani, Rudraksha Linga are seen on the western side, Brahma, Jiragareswara, Bhairava, Surya are seen on the eastern side. The four great saints, Chandra and Dandayudhapani are seen in a single shrine. Among the shrines the shrine for Muruga is huge with a mandapa and single tier vimana. A tarn is seen on the north. 1. Field visits on 15-10-2007, 12-042008, 14-08-2010, 19-06-2011.